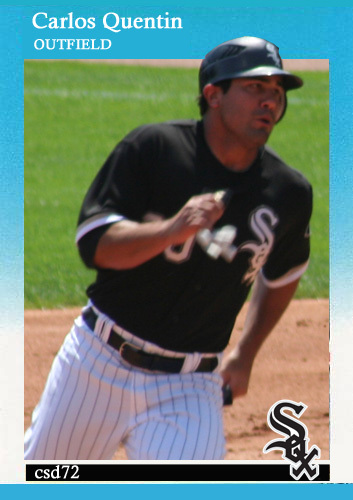 One of the good things to come out of the weekend series with the Red Sox is the fact that Carlos Quentin is still a member of the White Sox. To celebrate that fact I thought that I would make a more modern version of the ’87 Fleer card with him on it. I like the ’87 Fleer design, and was just curious to see what the modern emblem would look like on the card. I might try another one of these with a grey line at the bottom of the card. I took this picture Sunday as Carlos was rounding second on an Adam Dunn base hit. He then scored on an Alex Rios hit. What are the odds this season that both Adam and Alex would have back to back hits that resulted in a run? That was a special circumstance so I thought part of that should be put on a card. This entry was posted on August 2, 2011 by Pinola Photo. It was filed under 1987 Fleer, Carlos Quentin, Chicago White Sox, OF and was tagged with 1987 Fleer, Carlos Quentin, Chicago White Sox, Fleer.